With the release of the Great Wall Hobby Black Widow, modelers have expressed renewed interest in the P-61. Both the older Monogram P-61 and the Great Wall kit are not without their issues, mostly having to do with the engine and props. 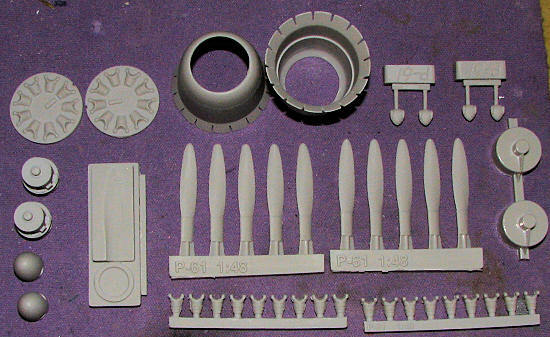 This new set from Modelshack takes care of all the issues related to the engine, cowling and propellers. The set can be used on either kit and provides adapters to use on the Great Wall kit. These adapters are not needed on the Monogram kit due to its design. In general, the Monogram kit does not provide a second row of cylinders, using a flat representation to take care of that. The GWH kit does, but the engine is not accurate. Of course, this set is for those who do not want to open cowling panels. Basically, you get two new cowlings with the cowl flaps open, the aforementioned adapters, the engine backing plate. A new forward crankcase with separate cylinders, a pair of magnetos for each engine, a new prop hub/spinner with attachment points for the new blades. You get more blades than you need, which helps if you break one. You also get a tool to help align each blade, which is a huge help. One simply sets the spinner in the recess then attaches the blades one at a time using the form next to the spinner recess. The set comes with step by step instructions that include both CAD images and photographs to carry you each step of the way. The end result will take care of the most egregious errors in both kits and go a lot way to providing a more accurate representation of what is a very large aircraft. What's more, the set is very reasonably priced, making it even more attractive.